Dr Lim Ing Haan is an experienced Interventional Cardiologist trained in managing complex coronary artery disease. Dr Lim Ing Haan obtained her MBBS degree in National University of Singapore in 1995. After completing her basic specialist training in Internal Medicine at TTSH and NUH, Dr Lim became Member of the Royal College of Physicians (Edinburgh) in 2001, and proceeded to advanced specialist training in Cardiology in 2001. Her general cardiology fellowship was completed in Tan Tock Seng Hospital between 2001-4. This was followed by training in Interventional cardiology in National University Hospital in 2004 and in Duke University Medical Centre in 2005-6 under the HMDP scholarship from Ministry of Health. Dr Lim attained board eligibility in ACGME (Accreditation Council for Graduate Medical Education) accredited Interventional Cardiology centres in USA in 2006. In recognition of her professional and research achievements, Dr Lim was inducted as a Fellow of the Academy of Medicine (Cardiology), Fellow of Medicine in Cardiology (Singapore), Royal College of Physicians (UK), Fellow of American College of Cardiology in 2009, Fellow of The Society for Cardiovascular Angiography and Interventions (USA) and Fellow of the Indonesian Heart Association in 2015. Duke University Medical Centre, where she received training in the latest advances in the field including Excimer Laser Atherectomy, Rotational Atherectomy, Percutaneous valve repairs was ranked amongst the top 3 Best Hospitals for Cardiology in USA. There she was involved in performing angioplasty and stenting for high risk and complex cases transferred to Duke from 11 referral hospitals in North Carolina, USA. Dr Lim mostly practices radial angioplasty in 99% of her cases where the access is the radial artery in the wrist rather than the femoral artery. This technique cuts down bleeding risk almost to nil. She was the Director of the Cardiac Interventional Laboratories in TTSH in 2008-9 and helped set up the 24 hour, 7 days a week acute heart attack interventional service together with the busiest emergency department in Singapore in 2008. Her cardiology experience spanned more than 20 years. 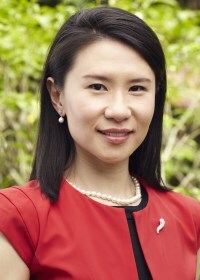 Besides complex coronary intervention, including treatment of chronic total occlusion and saphenous vein grafts, Dr Lim’s interests include peripheral intervention of lower limb and renal arteries, sports cardiology, preventive cardiology, cardiac rehabilitation, as well as non-invasive and invasive multimodality cardiac imaging. Dr Lim also offers percutaneous mitral valvuloplasty to patients who have severe rheumatic mitral stenosis. Dr Lim is the Organising Chairman of the Inaugural Singapore Cardiac Intervention Congress – OCT Workshop 2016 with Live Case Demonstrations transmitted from Mount Elizabeth Hospital and it was attended by cardiologists from 9 countries. Dr Lim is a highly respected physician in Mount Elizabeth Hospital and serves on the Mount Elizabeth Hospital Medical Advisory Board from 2015-2017. She is the Chairman of the Credentialling Committee for the Mount Elizabeth Hospital from 2015-2017. Dr Lim Ing Haan travels frequently to Japan, Korea, Myanmar, Vietnam, China and Indonesia to give talks to patients and cardiologists on the topics in cardiology. She was invited as a Proctor for Complex Cardiac Intervention in China and in Vietnam. Dr Lim Ing Haan is accredited to admit patients and perform angioplasty and stenting in Mount Elizabeth Hospital, Gleneagles Hospital, Mount Alvernia Hospital, Raffles Hospital, Farrer Park Hospital, Tan Tock Seng Hospital and National University Hospital. Dr Lim Ing Haan’s achievements are recognised both locally and internationally. She has been invited as Faculty to participate in many local and international interventional cardiology meetings, including AsiaPCR/SingLive, AICT and Kamakura Course in Japan.